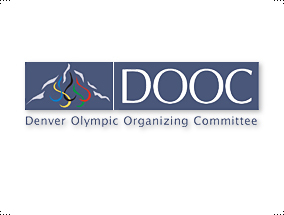 In order for the DOOC to gain momentum and to help vie for legitimacy in their effort to achieve recognition for Denver as a credible and valued host for the 2014 Olympics, a strong identity needed to be established. A strong Olympic brand which combines the essence of the Rockies, a focal point and strength of the Denver area, with the colors and inherent qualities of the Olympic rings was designed to represent the 2014 DOOC. As you see in the logo, the Olympic ring like elements rise towards the summit. The Olympic circles rise towards the summit, maintaining a fluid, athletic feel, while the "Rockies" have a jagged feel.